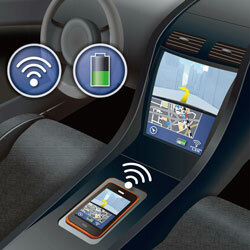 ROHM has announced the development of an automotive wireless charging solution with integrated NFC communication. This solution merges ROHM’s automotive-grade (AEC-Q100 qualified) wireless power transmission control IC with STMicroelectronics’ NFC Reader IC and an 8-bit microcontroller. Being compliant to WPC’s Qi standard supporting EPP (Extend Power Profile) enabling the charger to supply up to 15W of power, the multi-coil design allows a wide charging area that gives some spatial freedom in vehicle applications (2.7x greater charging range vs single coil configurations). This indicates that consumers do not need to bother much about precisely aligning their smartphones to the presented charging area to be able to charge wirelessly. At present, Qi, the most popular standard, has been adopted by CE4A as the charging standard in vehicles, and by 2025 it is predicted that the majority of cars will be furnished with Qi-based wireless chargers. While, NFC communication gives user authentication to enable Bluetooth/WiFi communication with the infotainment system, lock/unlock the doors, and permit engine start. NFC also allows vehicle setting customisation for multiple drivers such as seat and infotainment pre-sets, mirror positioning, and navigation destination pre-sets.